I’ve always wondered the relevance of books like 1-130 properties in 3.5 years. These were written from experiences during the property boom, and were based on having your properties revalued as their prices went up to access more loan funds. I’m wondering how you now apply these principles to stagnant market, or even falling market like we are seeing in some of the WA mining towns. Capital growth is certainly a fantastic positive to grow upon during the upswing cycles. Considering we can only rely on these conditions half of the time, it’s important to consider other strategies when times are flat or in the current case down. One option is high cash flow properties. Many properties in the resource towns can still offer cash flow positive returns during the downtimes. These returns can supplement the investors income and allow them to continue growing based on their debt level and individual circumstances. For investors stuck in a flat or downward cycle, it’s important to remember that this is a natural state of the property clock and that properties don’t keep increasing in value consistently year after year. Following years of growth there is always inevitably a period of stagnation and decline before the next growth stage swings round. Whilst property investors can grow their portfolio’s rapidly during the good times when grow is readily accessed, the responsible investor also prepares for the town times which inevitable will and do come each cycle. My favourite book is “More Wealth from Residential Property” by Jan Somers. I liked the book The Richest Man in Babylon – one if those mindset books but great for bedding down the simple idea of saving more than you spend. Love the above mentioned books. 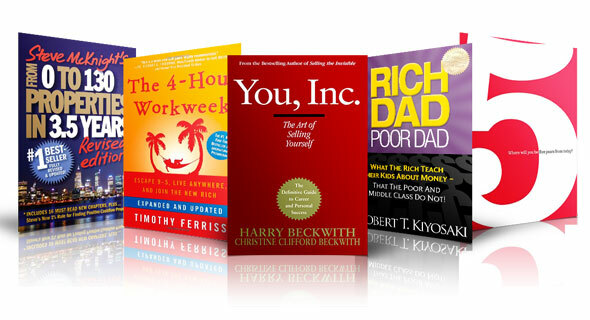 Though have not read You, Inc or 5. Another great book is Think and grow rich by Napoleon Hill, Money secrets of the rich by John Burley. Science of getting rich by Wallace Wattles. As a man thinketh. When do you decide that a property is not worth holding? I have had a property for 8 years now and i feel we are losing a battle for it to go up in value. We can afford to keep it but wonder if it’s worthwhile.